Save 10% with our new release sale! 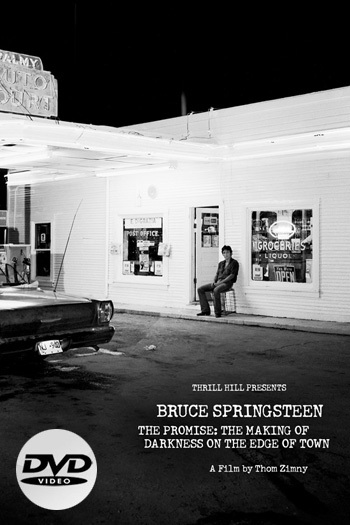 Directed by Grammy- and Emmy Award-winning filmmake Thom Zimny, this critically-acclaimed documentary chronicled the making of Springsteen's 1978 classic album. Also an official selection at The Toronto International Film Festival, The BFI London Film Festival, and The International Rome Film Festival, the film includes home rehearsals and studio sessions with new interviews from Springsteen, E Street Band members, manager Jon Landau, former-manager Mike Appel, and others closely involved in the making of the record. This documentary aired on HBO and was subsequently included in the six-disc box set The Promise: The Darkness on the Edge of Town Story. A 22-minute program originally aired on VH1 Classic and Paladaia. The focus is question-and-answer session before a small audience in the studios of Sirius XM's E Street Radio channel, hosted by Dave Marsh, with Springsteen discussing the writing and recording of Darkness on the Edge of Town. Footage from the box set (2009 Paramount Theater concert and rare archival footage from 1976-1978) is interspersed.